Water and sanitation services in the Liberian capital, Monrovia, are getting worse as a growing urban population tries to squeeze more out of already skeletal services. On 19 November, World Toilet Day, NGOs are calling on the government to up its allocation, and on international donors to reprioritize funding to stamp out cholera and cut child mortality. 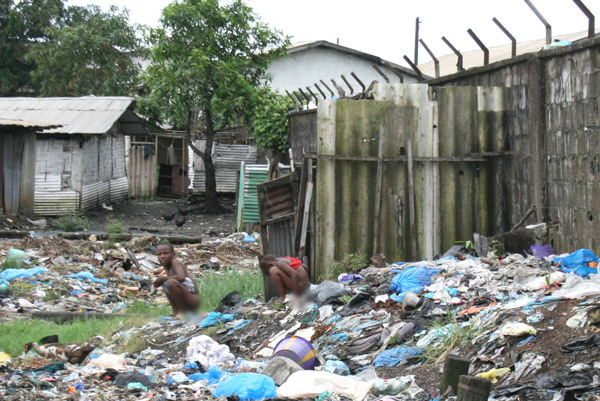 Just one-third of Monrovia's 1.5 million residents have access to clean toilets, and 20 to 30 cholera cases are reported weekly; in 2008 there were 888 suspected cases, 98 percent of them in Monrovia's overcrowded shantytowns such as West Point, Buzzi Quarter, Clara Town, and Sawmill. Poor or non-existent clean water and sanitation facilities are linked to high malaria and diarrhoea rates, Liberia's two leading child killers. In the Clara Town slum, 75,000 people share 11 public toilets and 22 public taps; West Point's 70,000 residents must make do with just four public toilets, said Bessman Toe, head of the Montserrado County slum-dweller association, which represents over 40 slum communities in and around the capital. Some households build their own toilets, but these tend to collapse during the seven-month rainy season, Oxfam emergency health engineer Jennifer Lamb told IRIN, so people defecate in the narrow alley-ways between their houses, on the beach, or into plastic bags, which they dump on nearby piles of rubbish or into the sea. A visit to a toilet in West Point costs 2.5 US cents; the young men running the latrines said there were around 500 users a day. The facilities can be smelled 50 metres away, with the floor of each squalid cubicle 15cm deep in soiled newspaper that residents use to wipe their posteriors. Staff use gloved hands to scoop the used paper into a wheelbarrow, which they lug to the nearby river or beach to dump its contents into the water. "The situation is just getting worse here. There are more people for fewer toilets; people just openly defecate between their houses - conditions are really bad," West Point community activist Darius Nyante told IRIN. In Clara Town's aptly named "Struggle Community" - a network of haphazard, rubbish-strewn streets, many of which are flooded for several months of the year - 10,000 residents share two privately owned water taps. When IRIN visited one of them, two young men were fighting over payment while the rest of the queue waited their turn to get water. Land-owners employ young men to manage the taps, who charge between 7 US cents and 14 US cents for 5 litres to 15 litres of water, depending on where the tap is located. Spokesman Toe blamed overcrowding for the overstretched services: thousands of Liberians moved their families into informal settlements in Monrovia, which mushroomed chaotically during and after the 14-year civil war that ended in 2003, and now there is very little land on which aid agencies can build toilets. 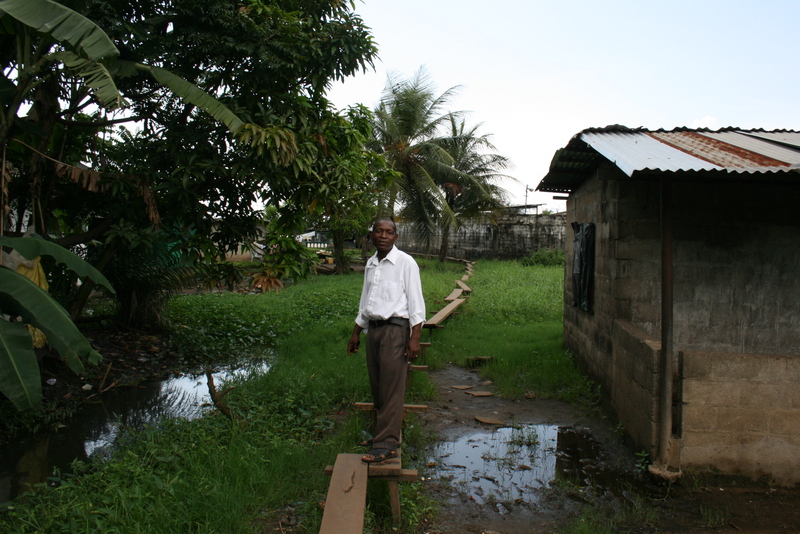 Concern, a member of the NGO water and sanitation (WASH) consortium, set up to try to improve water and sanitation conditions in Liberia, builds latrines and installs taps in urban townships as well as rural communities across the country, but most NGOs operate only in rural areas. Some NGOs are reluctant to build toilets in slum communities because of long-standing rumours that the townships will be relocated. "Do you invest infrastructure that could be destroyed, or do you wait?" said Oxfam's Lamb. An experiment in the 1970s to move people from West Point, a busy commercial and fishing area near the sea, failed because residents flocked back despite squalid living conditions, to fish and make a living as informal shopkeepers and service providers. Topography also complicates matters: many of Monrovia's slums are built on low-lying swamp land, making them difficult to connect to any existing municipal sewage system; building toilets in these conditions is expensive, costing approximately US$4,000 per six-toilet block, Concern's public health coordinator, Timothy Owhuchukwu, told IRIN. West Point activist Nyante said the Monrovia City Corporation allowed new residents to build houses wherever they pleased if the price was right, so septic tanks in West Point, Buzzi Quarter and Sawmill had become blocked and could not be emptied. Toe said residents were attempting to desludge the tanks with hand pumps. The government needed to increase its spending on water and sanitation from the current one percent of the total budget – equivalent to $15 million – to 10 percent, said WASH consortium spokesperson Muyatwa Sitali. He pointed out that the government spent seven times more on curative health than on preventive health. In a soon-to-be published report on water and sanitation in Liberia, Oxfam will call on donors such as the World Bank, the UK government's Department For International Development and the European Commission - which have supported water and sanitation improvements with $65 million - to commit a further $80 million in line with Liberia's poverty reduction strategy budget. Omarley Yeabah, an adviser to the Ministry of health environmental planning unit, who is in charge of ensuring water quality and promoting public hygiene awareness, said government resources were thin. "The challenges are enormous - our lack of capacity, a lack of vehicles, just a few people working on this in each county." Nevertheless, "The situation is not terrible, considering the war we just had." The Cabinet was reviewing a policy on water and sanitation that the UN Children's Agency (UNICEF) had helped draft, the organization's Hamidou Maiga told IRIN. Once that was in place, donors, agencies and the government might have greater clarity on their roles. Given the growing urban coverage gap in sanitation facilities and water supply, Sitali said NGOs, including Oxfam, were likely to step up construction of urban toilets and tap stands. Logistical and financial hurdles were not the only challenges. Building more toilets was the first step, said Concern's Owhuchukwu; forming and sustaining community committees to keep them clean, and encouraging community members to pay to use them, would take ongoing effort. Standing behind six toilets built by Concern in Sawmill, community chairman Henry Varnuy told IRIN that the residents' attitudes to open defecation were changing. But while he was speaking, two children squatted behind him to defecate on a mound of rubbish. Yassa, 10, pointed at the toilet. "No enough money," she said, "so I go outside."